Maria Poe Clemm was aunt to author Edgar Allan Poe, and mother to Virginia Eliza Clemm, Poe's wife, making her also Edgar's mother-in-law. She was the younger sister to Edgar's father David Poe, Jr.Called "Muddy" by Edgar, she loved him as her own son, lovingly calling him "Eddy". 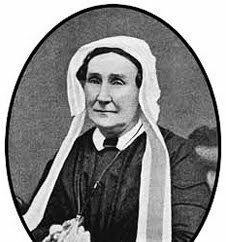 She served as a much-needed mother figure to him in much of his adult life, cared for the sickly Virginia, and managed a household for the couple from 1829 until the deaths of Virginia in 1847 and Edgar in 1849.She lived to the enviable age of 80.